after that index made a low of 4728 and 4741 the next day. Majority of the analysts were looking at a possible short trade but we got into a contrarian view to buy the decline. Keeping in mind the volatility the option to buy till 4550 was open in case of any adverse news. Since then now Nifty almost did 5000 which is a cool 250 points from the low satisfying our previous VIX views of 6-8% jumps. Look at our previous contra trend updates on India Vix. After the US downgrade and many other news index was at 4950-5000 on 9 the August and today on 10 October the index is still at 4950-5000. The above statistic looks surprising in terms of how the sentiments have moved around in the last 2 months !!! with the index at the same place. Many traders got trapped on either side due to sentiments and we at Analyse India kept alerting on how to buy the dip and book the rise. In the same period we did a lot of Option Strategies to get 5-7% returns utilizing the sluggish index conditions. We would soon be introducing a Option Strategy + Nifty calls combo service at a discount next week. The current view is to watchout for resistance at 5035-5050 and till we dont cross 5120-5150 trendline we may need to follow the simple strategy of buy the dips book on rise :). Although this week may see lot of stock specific action but trades will have to be quick. on a lighter side Blackberry Services have just stopped functioning:) for many telecom operators , there would be lesser inside info and Heard on Street tomorrow if issue not resolved tonight. I am enclosing hourly Gold chart and it seems it is going for a further rise. Can you please comment. I think gold is strong above 1700, if able to cross that in next 3-4 trading sessions then we can see quick 100 $ move in gold. Nooresh Sir i have bought moldtek packaging bse code no. 533080. I have bought 2000 shares of this company @ 56. it has hit 65 in intraday today and closed at 63 level. What level should i look to book my profits. 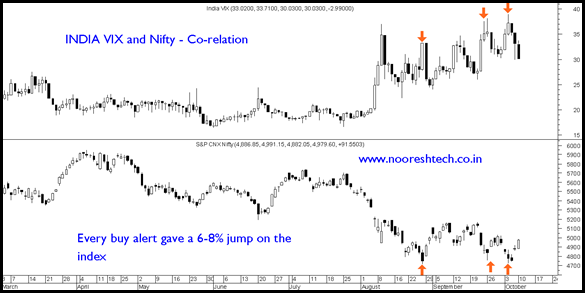 I liked your snippet on negative co-relation between VIX and NIFTY. However the deduction I could not see . Have u regressed it ? I of my own had been trying to find out a Discriminant Model on this. Further do u have any work on SMR ? I think you should search for India Vix on the blog and go through all the posts and will come to know about the 🙂 deductions and how we timed our entry. Sir,.I am reading into your comments about the inverse correlation of nifty with indiavix. It is quite interesting and informative for short traders. I am a day trader and want to improve upon my day trading. I shall remain highly obliged if some other correlations are made known for example , dollar index,crude,dow jones etc.,especially with respect to specific sectors like IT /METAL/REALTY. 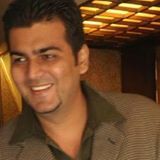 Well co-relations work only for small time so cant trade on them but keep them in mind.